Ever Wonder About What’s in Your Walls? If you’re like most people, you don’t spend much time thinking about what’s inside your walls. Out of sight, out of mind, right? You’re more interested in what’s on your walls, like pictures of family, paintings, and other decorative items. You don’t give a second thought about wood studs, wiring, conduit, or living creatures. What? Living creatures?! Yes, it’s true. There are all kinds of bugs and wildlife that take up residence in our walls. If you could see through your walls, it would probably shock you. You may or may not know this, but your walls are hollow. Between each of the wall studs inside your wall is space where living creatures can dwell, large creatures like squirrels, bats, rats, and mice all the way down to the tiniest of bugs. In fact, your wall voids are the perfect place for a wide variety of creatures to live. Inside your walls, it is warm, safe, and probably close to a food source. What creature wouldn’t want to live there? You might think that having bugs and animals in your walls would be obvious, but most of the time it is not. Mice: When mice first get into your home, you may hear them at first. They often climb up and down through wall voids to get from your attic spaces to your pantry or kitchen food storage. But, once they find a food source, they establish themselves close to it. That means, they’ll settle in behind your pantry, and will no longer be bumping in your walls. Carpenter ants: If you have carpenter ants inside your wall voids you may never know it. Carpenter ants can live on a wide selection of foods, many of which are more easily found outside of your home. 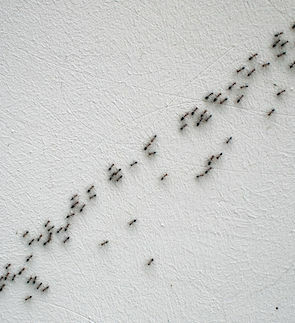 So, while they are damaging your walls, you may never see a single ant. Spiders: You can have hundreds of spiders inside your walls and never know it. Spider webs–the obvious sign that you have spiders–are usually established when there is a food source to gather. If you have no flies buzzing around, you’re probably not going to have spider webs. But that doesn’t mean that you don’t have spiders. Bed bugs: Many bugs can go into wall voids and stay dormant for months, like bed bugs. If you have a pest problem, and it seems like you fixed it, it may just mean that these pests have enter a dormant state. The hollow spaces in your walls are also perfect for cockroaches, ladybugs, stink bugs, boxelder bugs, and a whole host of other bugs and animals. But what you can’t see can hurt you, your family, your pets, your home, and your belongings. If you are having a problem with pests in your walls or anywhere in your home, call Alexandria Pest Services at 703-923-0925 to schedule a professional evaluation. We can help you get rid of these invaders in your home or office.